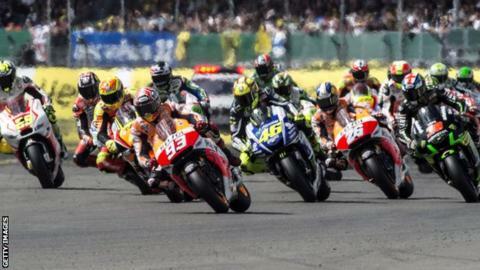 The 2015 British MotoGP has been left without a venue after Donington Park called off its agreement with Circuit of Wales to host the race on 30 August. Circuit of Wales signed a five-year deal to stage the race from 2015, but as the venue in Ebbw Vale has yet to be built, Donington stepped in. Donington says the Circuit of Wales has not met agreed payment deadlines, but the latter denies the claims. Silverstone, which hosted MotoGP between 2010-14, could stage the race. Silverstone's owners were "extremely disappointed" when their deal was not renewed after significant investment to allow the circuit to host MotoGP. In a statement, Donington Park said that as Circuit of Wales was unable to complete funding arrangements, the venue's operational plans to host the race had been delayed. "Both the commercial risks and the lack of time are now too great to allow Donington to proceed," Donington Park said in the statement. "Therefore Donington Park must withdraw from other participation." The circuit's managing director, Christopher Tate, said: "The position we are now in is of course frustrating and uncomfortable for all concerned. "It is this week, way past any normal deadlines, when we - in partnership with Circuit of Wales - would have been committing to major expenditures. "Circuit of Wales have made it clear to us that they are not now in a position to complete, so we have to withdraw and end the planned arrangement." But Circuit of Wales said in a statement that it is "disappointed to have been unable to reach a contractual agreement with Donington (DPRL)". It added: "Contrary to claims that Circuit of Wales is unable to meet the funding arrangements, we are unwilling to provide the significant funding that DPRL required for the necessary track upgrades to host the British Grand Prix without a signed contractual agreement. "We have all of the funding necessary in place to promote and host the 2015 race in the UK. "All funding for the flagship Circuit of Wales regeneration development in Blaenau Gwent is on track with works due to start later this year following the outcome of the public inquiry in March. "The Circuit of Wales will continue to promote the British round of the MotoGP World Championship and is fully committed to delivering the event later this year." Circuit of Wales was expected to be a purpose-built hub for the multi-billion pound British motorsport industry around a state-of-the art track. However, the £315m project has been delayed with issues over common land and calls for the Welsh and UK governments to commit up to £50m towards the scheme. Last month, it was announced that plans to build the venue in Ebbw Vale will go to a public enquiry in March. The MotoGP season, with Honda's Marc Marquez the defending champion, starts on 29 March in Qatar.